The VeriFone Tranz 460, a combined printer and terminal, can be an ideal credit card processing system for switch from paper to electronic processing of payments, providing top performance as a POS (point of sale) solution. The Tranz 460’s 128 Kb of RAM (Random Access Memory) allows the device to handle large transaction batches and applications, providing a complete POS setup at much lower cost than the purchase of a separate printer and terminal, while saving counter space by putting dual functionality into a single footprint. The integration of the printer and terminal comprising the VeriFone Tranz 460 eliminates the messiness of printer cables, lowers the shipping cost, and makes setup easier by eliminating the need for configuration switches and additional power plug sockets for the printer. The built-in printer provides clearly printed two-part receipts, providing a comprehensive audit trail report for comparison with the electronic record and thus allowing accurate balance at the end of a day’s business. By using an impact printer, the VeriFone Tranz 460 allows the use of either impact-sensitive paper (eliminating ribbon replacement costs) or carbonless paper with a ribbon, which provides more darkly printed first copies. The printer’s simplified paper guides help prevent jamming. The Tranz 460 allows quick updating, addition, or creation of applications by use of VeriFone’s TCL™, which is the programming language in widest use in transaction automation. In addition, the use of VeriFone’s download program ZONTALK 2000™ allows direct, speedy download of the Tranz 460’s system parameters. To complete a POS system, the VeriFone Tranz 460 can be combined with any of these VeriFone PinPads: 101, 201, 1000, or 2000. The Tranz 460 allows 400 transactions for retail applications, 300 for hotels. The VeriFone Tranz 460 is not suitable for hotels and restaurants or for car rental agencies. A terminal and printer in one, the TRANZ 460 is the ideal transaction system for merchants switching from paper to electronic payment processing. The compact, integrated VeriFone TRANZ® 460 system is a top performer at the point of sale. Available with 128 Kbytes of random access memory (RAM), it handles large applications and transaction batches. 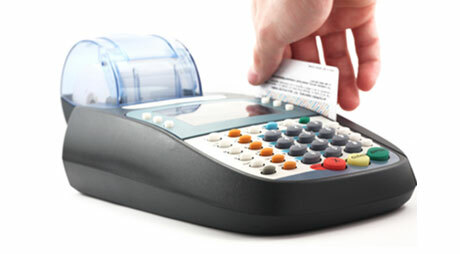 It provides a complete POS system at a fraction of the cost of buying a separate terminal and printer. And it's a real space saver, packing dual capability in a single footprint. An all-in-one unit, the TRANZ 460 has no messy printer cables to worry about, and it costs less to ship. Plus, it's easier to set up, with no DIP switches or separate power plug for the printer. Through its built-in printer, the TRANZ 460 generates crisply printed two-part receipts. And it provides a complete audit trail report to compare with the electronic record, for accurate balancing at the close of the business day. Because it uses an impact printer, the TRANZ 460 gives you the option of using carbonless paper with a ribbon for darker first copies or impact-sensitive paper to eliminate the expense of periodic ribbon replacement. It also prevents jamming through simplified paper-path guides. The TRANZ 460 system's 2400-baud modem results in faster batch uploads by speeding communication with the host computer. It also decreases download time for applications, making field updates even easier. You can quickly add, update or create new applications using VeriFone's TCL™, the most widely used programming language in the transaction automation industry. And you can quickly set up the system through ZONTALK™ 2000, the VeriFone advanced download program. ZONTALK 2000 lets you download individual TRANZ 460 system parameters directly-in a minute or less. It even supports telephone downloads over the same phone line. Which means no additional equipment is needed at the remote site.